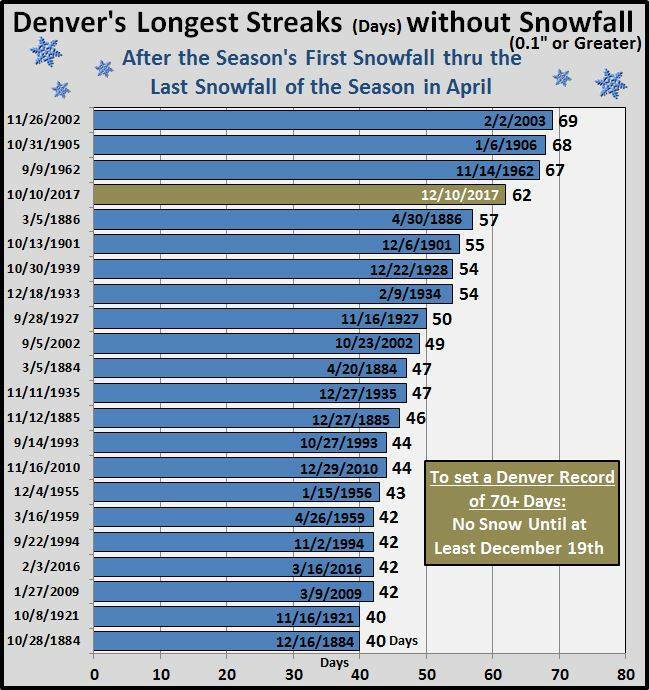 While we’ve been lucky enough to have at least a few small storms, Denver is in even worse shape with no measurable snowfall in over 60 days! Should Denver make it to December 19th with no measurable snowfall, it would set a new record as longest streak of continuous days without measurable snowfall. Notice the strong ridge to the West. 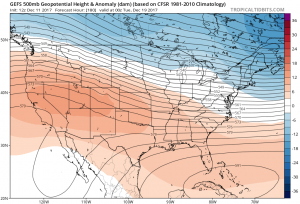 This pattern keeps us dry and warm along with areas like California and the Pacific Northwest. 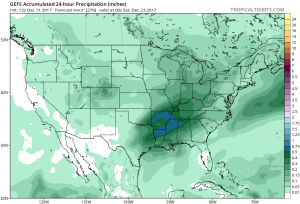 This pattern has been incredibly stubborn and has seen a majority of the cooler and wetter weather sliding along the jet stream East of Colorado. 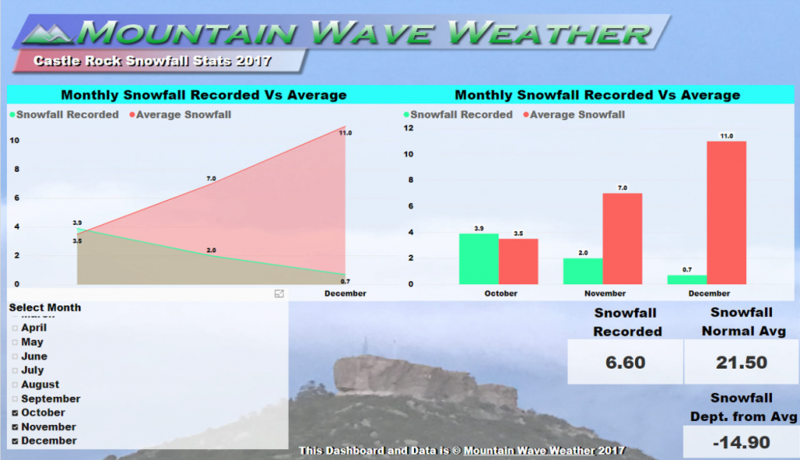 In fact, some parts as far South as Texas, Georgia and Florida saw decent accumulating snow this week. 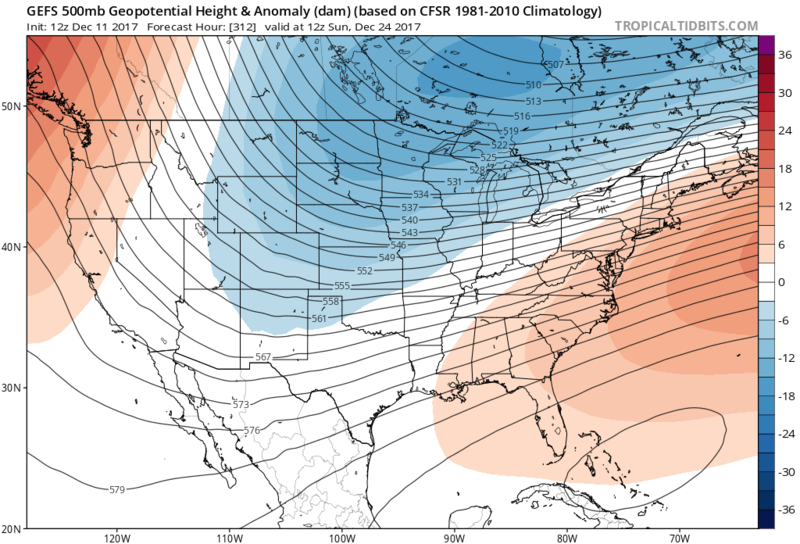 This pattern looks to linger over the next 5-7 days so expect us to continue warm, windy and dry for at least that period of time. 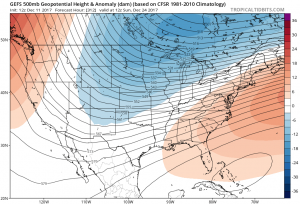 Next week shows a more “zonal” flow but Colorado still looks to have a similar weather setup. 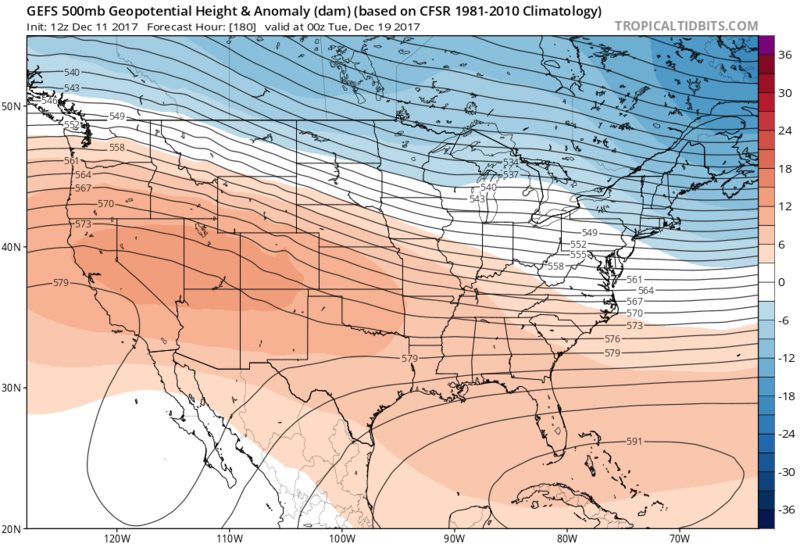 By next week the ridge begins to break down and shift Westward a bit, but you’ll notice the reds and oranges stay over Colorado and the Western United States. In a pattern like this we’d expect to stay mainly dry but a bit cooler with the ridge breaking down. 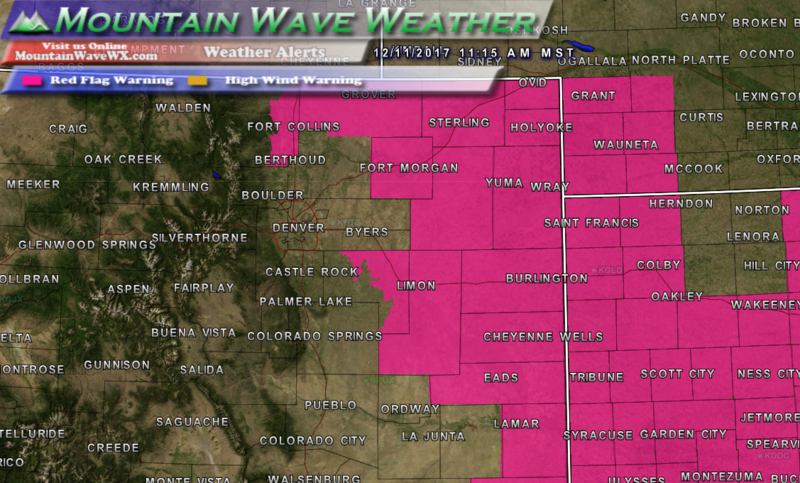 The lines close together generally mean we will see windy conditions continue, especially across Northeastern Colorado. So we will jump to Christmas, because everyone likes the potential of a white Christmas right? We see some blues over Colorado and the central U.S. This image is towards the edge of this model’s range, so it must be taken with a huge grain of salt. This is a long ways out and has a lot of time to change between now and then. This looks similar to the “backdoor cold front” type of storms we’ve been seeing all year. This generally means we see colder air, a lot of wind and only minimal chances for snow. By the way, there is a Red Flag Warning in effect for Eastern Colorado and Eastern parts of the Palmer Divide for today (December 11, 2017 ) until 5pm. 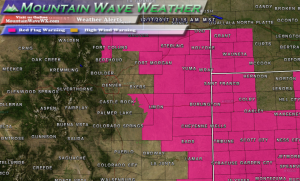 Expect to see more Fire Weather Warnings in the next 2 weeks! 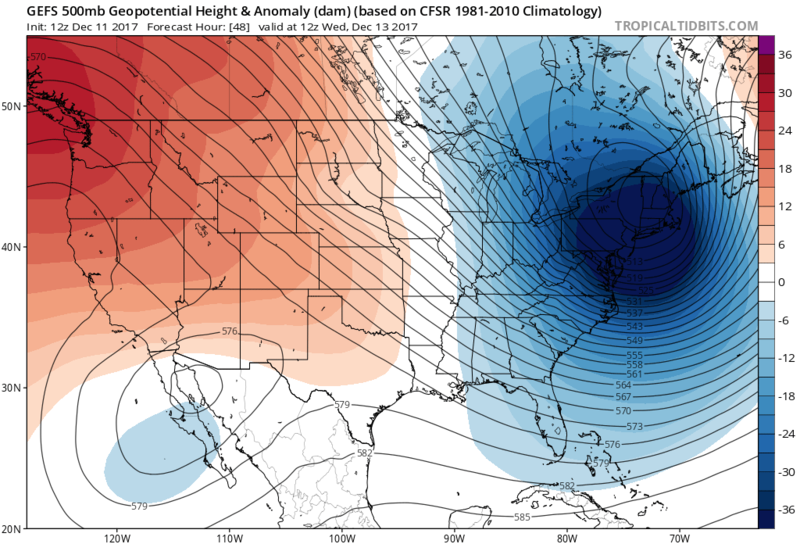 There is a slight glimmer of hope for snow lovers (or at least cooler weather lovers) right around Christmas time. 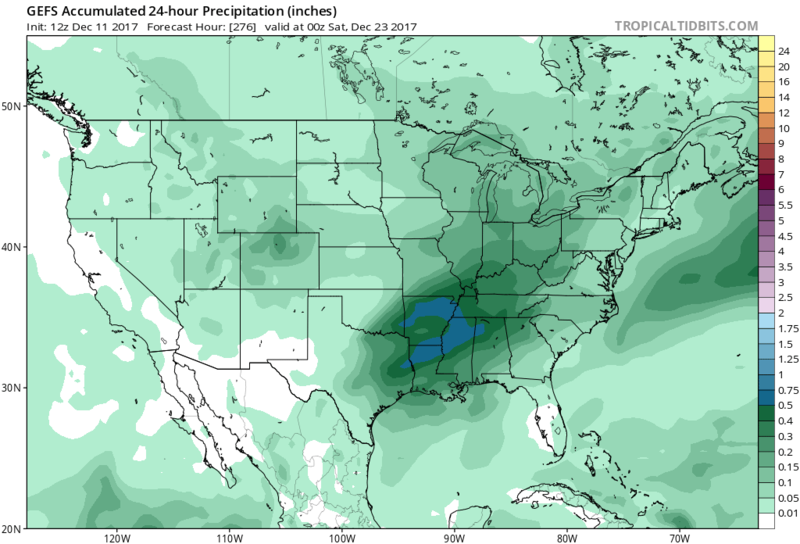 If a storm does form, we have serious concerns about available moisture and if the trough sets up far enough South to bring us any upslope. There are more questions than answers about this setup as of right now. Please do keep in mind though, being that far out, the model accuracy is noticeably lower. We don’t have high confidence in a weather pattern change and/or chances of snow just yet. We’ll keep looking out over the next couple of weeks for a hint of any change, but right now it looks like more of the same. Keep doing those snow dances!